An independent, external financial statement servicer is probably something you don’t want your business to have to go through. You have to answer a bunch of questions, deal with interruptions, and provide every single invoice, customer receipt, and so forth that you have. But it’s one of the most important things you can do for your business. That’s what makes financial statement services so advantageous. When an external financial statement services team comes to your place of business, you can be sure that they will provide quality, unbiased opinions on the quality and accuracy of your financial statements. When you have both, you can be confident the value and credibility of your business will increase. So although you may have short-term annoyances when you hire a financial statement services team, they may just get you prepared for potential catastrophe down the road. 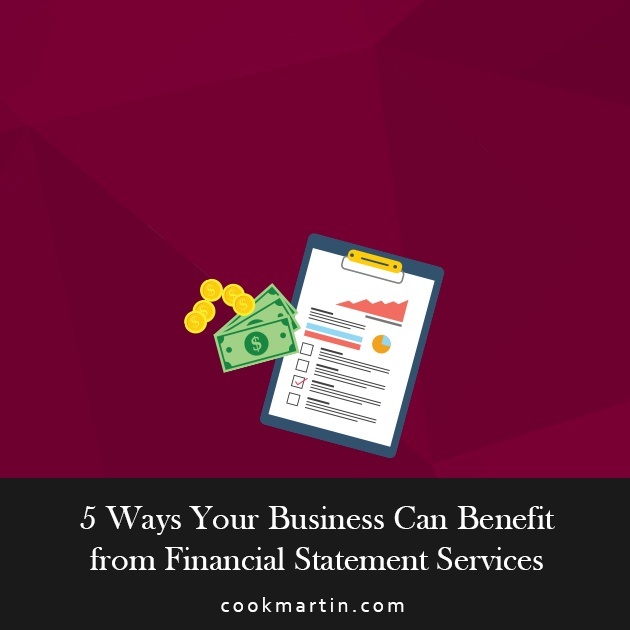 To show you just how much these services can help, we’ve compiled four ways your business can benefit from financial statement services. Instead of having to allocate money towards an in-house accounting department, let a company like Cook Martin Poulson take care of it. These unwanted costs contribute to at least a 20-30% increase in your payroll costs. Hiring external financial statement services will also give you and your business more flexibility. Do you have fluctuating workloads? Utilizing these kinds of external service providers allows you to give them hours and take them away easily. The extra costs of hiring and firing are erased when you take this route as well. Likewise, when you bring these workers on, it’s comforting to know they are specialized experts and that you can trust that they will be much more productive than hiring an employee who you have to train first. By having a consistent servicer in this area, this allows the individual to stay present with the service, and you won’t have to waste any further time or money on bringing an external person up to speed each year. When a business receives financial statement services, they’re hiring expert accountants whose sole responsibility is to determine whether their client’s business is complying with statutory and government rules and new Internal Revenue Service regulations. There are various laws that accountants working in this service must follow. These can vary from state to state, but ensure you will be receiving appropriate work. Ultimately, the external party will be able to offer your business an unqualified, or more commonly referred to as a ‘clean’ opinion on your business’s financial statements. GAAP is the highest U.S. authority for accounting standards, and its regulations are required any time a business is preparing financial information. The financial statement service is guaranteed to follow these regulations and can educate you, as a business owner, on the importance of following these guidelines throughout the year. The external accountants will also let you know where you may have inefficiencies. Simply put, they are there to shoot straight. An internal employee may have more of an incentive to hide wrongdoings with financial reports. External accountants also have no fear of repercussions and can give you an in-depth analysis of how your business is operating. This honesty isn’t typical when a business has an internal review of their financial statements. Employees will often be more frightened of the consequences of delivering bad news to their employer. In business, we often need the assistance of outside stakeholders to help us keep what we earn. Whether those giving assistance are stakeholders, creditors, or private investors, they often need assurance that the company’s financial statements accurately represent its true financial position. When your financial statements have been reviewed and evaluated by an external source, your business will have more credibility in the marketplace than those who have not. Lenders, investors, and potential clients will all be more confident in a company when they have been externally audited. It's also been seen that businesses are typically more able to attract better terms, such as on a loan if your business has externally audited financial statements. This provides some level of security to the lender that the accounts are error-free and your business has most likely not committed any fraud. Although it may come at a cost, in the beginning, building an excellent reputation is a part of your brand that will have a significant impact on the long-term success of your business. It’s an intangible asset that could increase your company’s value and increase your opportunities for future, sustainable success. We hope that your business is running smoothly without any inefficiencies. Unfortunately, this isn’t always the case for a company. Luckily, financial statement services will be able to detect areas where there might be some inefficiencies within your operations. Even if everything is running smoothly, an external accountant will have the expertise and experience to recommend certain processes that will help make your business more efficient. You won’t have to implement these recommendations immediately because every suggestion won’t work for your company. But, it’s always good to have the information and have identified areas in which your business can improve, and you can start working towards a long-term plan that will have your company running like a well-oiled machine. External financial statement services will be able to review your internal controls and be sure your business is following guidelines that will ensure your success in the future. For example, they will make sure you have an adequate paper trail that is imperative if your business is ever exposed to an HMRC tax investigation. Servicers will review the technological systems you are using and will either say they’re good, or they will recommend better products that would be more efficient and effective for your team. The financial statement services team will review how duties are segregated to employees. According to the AICPA, segregation is an important aspect to consider when trying to safeguard against fraud and human error within any business. Internal employees are often blinded from risks, opportunities, and the like because they have been focusing on the same issues for so long. When an external group comes in to deliver financial statement services, they come in with a fresh set of eyes and a new perspective that can prove to be very fruitful for their clients. In other words, they don’t have any biases towards what they like or dislike about the company, like personnel favorites or unwillingness to change for the company. When a corporation and its employees are averse to change, this could delay needed process improvements that will enhance and promote growth. When an external group comes in to deliver their service, they are able to verify that the procedures used to report and compile a company’s financial information are satisfactory. If it isn’t, the external group can provide or recommend internal controls that will reduce the possibility of misreporting or fraud. A certified CPA can provide you with a list of weaknesses they have identified within your business. These suggestions are important to consider, and if you implement the recommended solutions, you should see your day-to-day operations run more smoothly.